We have soon quiet a few different coffee tables here on Geeky Gadgets, from the geeky NES Controller Coffee Table, to the cool RGB LED Coffee Table, here is another cool one that would look great in your geeky apartment, the Foosball Coffee Table. This fun Foosball Coffee Table measures 47 1/2 inches long, by 28 inches wide and 20 inches high, I would love one of these, not sure the Mrs would let me have one though. This is the coffee table with a built-in foosball game. Made from solid poplar, the table stands 20″ high, allowing you to sit comfortably or kneel while grasping your team’s three hand-carved, solid wood control rod handles. You can maneuver your forwards, mid-fielders, and defenders with precision–their stout polypropylene construction enables them to withstand the hardest of shots as you move to protect your goal. 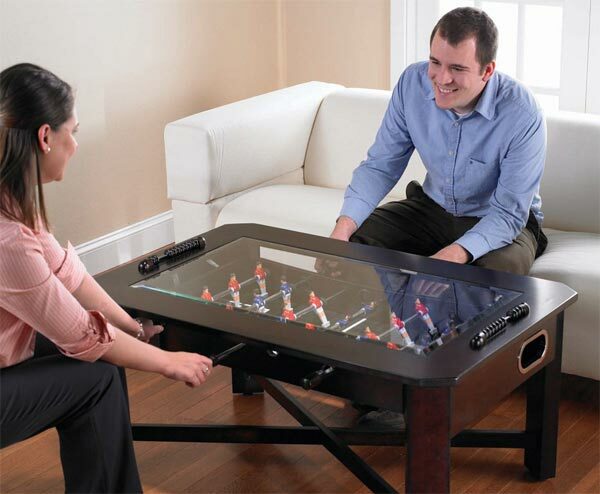 If you want one, the Foosball Coffee Table is available for $600 from Hammacher.